As national and state programs fall short of fully addressing homelessness in California, local governments are coming together to find solutions for their communities. Collaboration, cooperation and support at the local level are key to addressing this crisis. That is why the League of California Cities and the California State Association of Counties (CSAC) formed the Joint Homelessness Task Force in late 2016 to examine these issues and discuss collaborative local solutions to address homelessness. The task force met over the course of a year to better understand homelessness in California. The task force wanted to identify not only known best practices but also promising new practices that cities and counties are implementing to address homelessness, as well as the challenges, lessons and gaps communities are facing in the fight to end it. 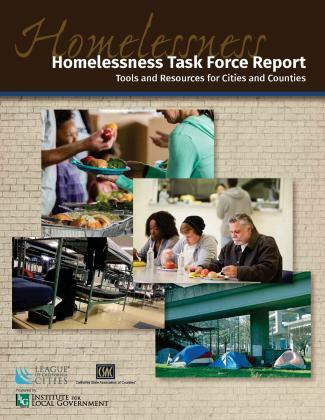 The culmination of the task force’s work is a report, developed in partnership with League and CSAC affiliate the Institute for Local Government, which provides practical tools for cities and counties in California to use in addressing homelessness in their communities. Sections of the report are detailed below, or read the full report here. Distressingly, the increase is due to large increases in the number of unsheltered homeless people — those who not only have no place to call home, but are not able to find even temporary shelter. The demographics of homelessness are changing, too. Many homeless individuals struggle with substance abuse disorders and mental illness. However, domestic violence, lack of affordable housing and employment opportunities and the cost of health care have also pushed individuals into homelessness. In addition, thousands of Californians are displaced every year by natural disasters such as floods and wildfires. California is home to 21 of the 30 most expensive rental markets in the nation and the state does not have enough affordable housing stock to meet the demand of low-income households. The state’s 2.2 million extremely low-income and very low income renter households compete for 664,000 affordable rental homes. As national and state programs fall short of fully addressing this issue, local governments are coming together to find solutions for their communities. Collaboration, cooperation and support at the local level are key to addressing this crisis. That is why the League of California Cities and the California State Association of Counties formed the Joint Homelessness Task Force in 2016 to examine these issues and discuss collaborative local solutions to address homelessness. Local government representatives met over the course of a year to better understand this issue in California. The task force wanted to identify not only the known best practices but also promising new practices that cities and counties are implementing to address homelessness, as well as the challenges, lessons and gaps communities are facing in the fight to end it. Details of the task force’s work are outlined here. This report provides practical tools for cities and counties in California to use in addressing homelessness in their communities. It offers details on how to create a homelessness plan, identify resources and funding for homelessness and build support in communities to address homelessness. To successfully reduce homelessness, local governments must continue to be creative and must keep moving forward. Each city and county is unique and may be at very different stages of addressing homelessness in its community. However, to succeed in addressing an issue like homelessness, local governments must learn from each other to collaborate and forge partnerships. We look forward to the day when every Californian has a path that leads them home. The January 2017 point-in-time count found that homelessness in California increased 13.7 percent from 2016–17, making it one of 22 states to see an increase in the number of men, women and children experiencing homelessness. Statewide, 134,278 Californians were counted as homeless; however, experts agree that the number of people without housing is three to four times higher than the point-in-time count. This marks a disturbing reversal of the trend from 2007–15, which had seen a 16.7 percent drop in the state’s homeless population. Of those counted in 2017, 68 percent or 91,642 people were unsheltered — by far the largest homeless population in the nation. data about their homeless populations in a variety of ways. This section presents information on how preventative services can result in cost savings for local governments and a few examples of software and approaches that local governments statewide are using to collect data about individuals and families experiencing homelessness in order to provide better case management. Jurisdictions statewide are prioritizing homelessness in their communities because the benefits of addressing this problem will help improve the overall health of their communities. Fortunately, cities and counties can use a number of existing resources, services and programs to address this complex problem. The list below provides a starting point to think about what could work in your community — but each city and county is unique, and therefore individual approaches should be based on the community’s unique needs and resources. Whether a city or county has been addressing homelessness for years or is just starting, having a plan is important. The plan provides direction for elected officials and staff as they make decisions about where to dedicate resources and offers a way to measure progress and success. Whether the plan is for one year or multiple years, it is likely to involve multiple individual actions or strategies that may or may not be related. This section includes a series of questions a city or county should explore when deciding what strategies to include in its plan and a template to outline individual strategies. Depending on the jurisdiction, the plan might include anywhere from two to over 100 individual strategies. Complex problems such as homelessness are not often solved or addressed by a single entity. 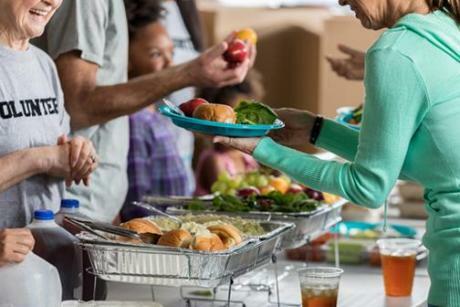 Local governments should consider a number of key partners when addressing homelessness, such as the business community, nonprofits, the faith-based community and philanthropic organizations. In many cases, these entities are already addressing homelessness — establishing partnerships with them will allow your city or county to amplify existing efforts and enhance other organizations’ efforts. This section offers tips to consider when forming partnerships and examples of successful partnerships. Housing can be a contentious and complicated topic in communities. For this reason, cities and counties are increasing their public engagement efforts in the planning process, which offers many benefits. Engaging the public early in the decision-making process can help local public agencies avoid costly pitfalls and mistakes. Involving residents and others in the process can generate more support for the final decisions reached by city or county decision-makers. This section offers tips to and resources to help you better engage your community.